Nemo was lost on the Ocean ... While he was looking for his way back home, he lived amazing and unforgettable adventures! He met new places, new people and made new friends. But now he's back for good! 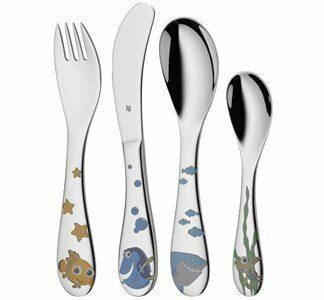 This adorable cutlery set, is adorned with this friendly clown fish and his friends, so that children have fun while learning to eat all by themselves. The best friend to learn and grow, to earn a place on your table and in your heart.